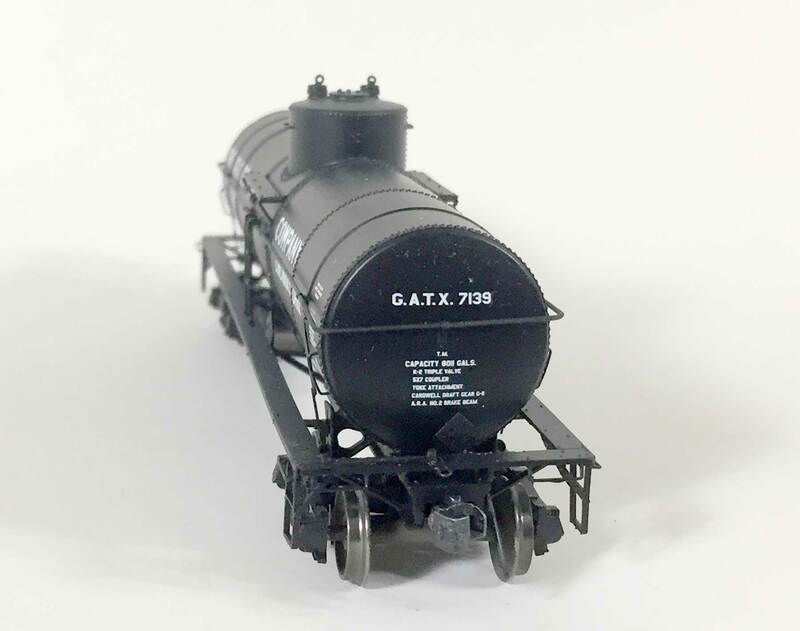 Dave Parker sent a summary of this fine new HO scale plastic tank car model. Here’s Dave with his impressions of the model. For about a decade, Tangent Scale Models has developed a reputation for exquisitely detailed and meticulously lettered ready-to-run (RTR) freight cars (and kits) – at reasonable prices. Heretofore, Tangent’s models have largely appealed to transition- and modern-era modelers. The only offerings that (barely) made the cut for 1920s modelers were the 1930 STCX and 1929 COSX three-dome tank cars. A brief review can be found in the guide to 1920s HO scale plastic freight cars. 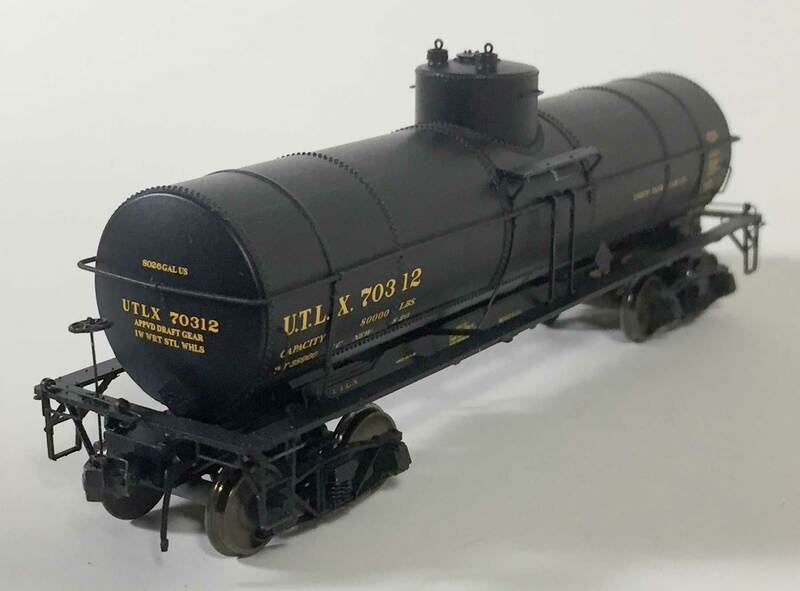 In early November of last year, Tangent caused quite a stir in the HO-scale community with the release of their 1917-design, 8000-gallon tank cars built by the General American Tank Car Company from ca. 1916 to 1920. I am not sure if anybody knows how many were built, but it was certainly several thousand at least (there were also quite similar 6,000- and 10,000-gallon cars). These cars were distinctive because they retained the upper radial courses that would eventually give way to longitudinally-oriented courses in the early 1920s. Moreover, they were part of a wave of Master Car Builders (soon to be American Railway Association) Class III (a.k.a. Spec III) tank cars that, effective May 1 of 1917, required double rows of rivets. Older Class II (single rivet-rows) cars ran the rails for many years thereafter, but none were built after the adoption of the Class III standard in 1917. Two of the tangent cars are now in service on the Wheeling Freight Terminal. Tahoe AC&F arch bar trucks have been installed with semi-scale wheel sets. 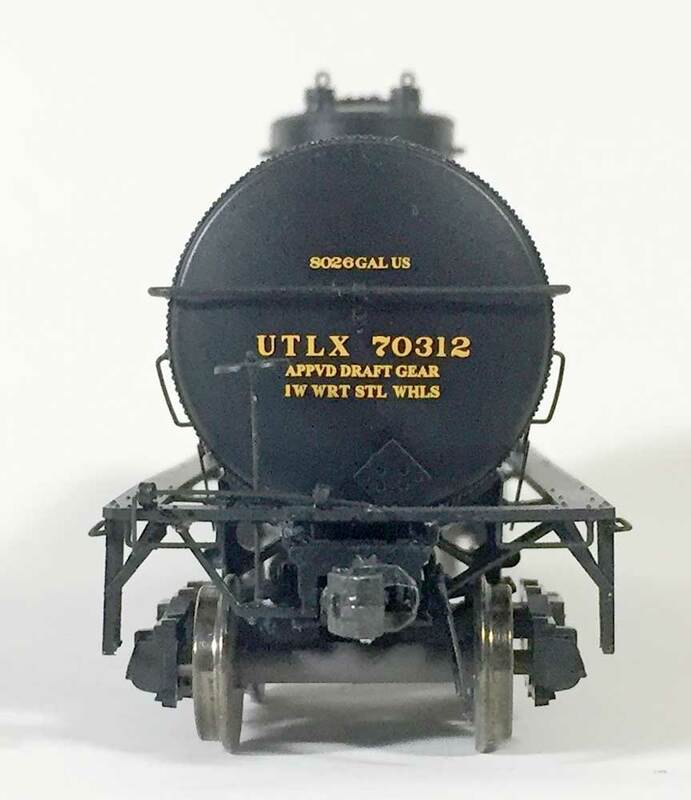 The initial releases of the Tangent models (which have all sold out as of this January 2017 writing) included later (1940+) lettering schemes for the Union Tank Car Company (UTLX), Deep Rock, and A. E. Staley. Moreover, there are variations in the brake gear, draft gear, and other physical details. Notably, these variations allow for accurate modeling of these cars as they appeared in the 1920s (and 1930s), and the initial releases included RTR “Original 1920+” UTLX cars, as well as some for the Globe Soap Company of Cincinnati, OH. My objective here is to briefly review the strengths and weakness of these two offerings, and to offer some comments on other modeling possibilities (including likely future releases from Tangent). My focus will be on the models’ suitability for 1920 through the mid-1930s (I model 1934-35). Structurally, these models are extremely well-crafted. The injection-molded styrene bodies are crisp and finely detailed, especially the dome components. The grab-irons are wire, as are the (“operational”) uncoupler levers. The KC brake system is faithfully reproduced and, although fragile, the plastic piping appears to be scale (or very close to it). Viewed from below, the underframe is fully detailed, and includes brake levers and rods. The cast “knees” above the bolsters that support the tank are “see-through”, a nice bonus detail in my view. The draft-gear boxes and Kadee couplers are both semi-scale, and air hoses are included. The Tahoe truck replacements are not a drop-in fit. The hole in the Tahoe truck bolster needs to be enlarged with a 9/64-inch drill bit to enable easy clearance of the Tangent kingpin boss. The model comes with dome platforms and ladders on both sides of the car. According to UTLX guru Steve Hile, all of Union’s X-3 design cars built in the teens and twenties had just one platform on the brake-cylinder (left) side of the car. Moreover, we know that GA built many of the 1917-design cars for Sinclair with a single platform (see below). Although there is no definitive photographic evidence, my preference would be for a single platform on these UTLX cars. It may be possible to modify the RTR car accordingly, but I have not yet endeavored to do so. More easily corrected is the issue of the proper trucks. The RTR model comes with Tangent’s nicely tooled American Steel Foundries 50-ton CSF trucks, which sport a five-spring package. As delivered, these cars rode on arch-bar trucks, and 1920s modelers should consider replacing the factory trucks with arch-bars from Tahoe Model Works, Kadee, or Tichy. When the as-built trucks were eventually replaced due to the 1941 ban on arch-bars in interchange, the new trucks were likely 40-ton CSFs, for which Tahoe’s model 115/215 would be an excellent choice. The only other question in my mind is the basis for the diamond-shaped plates for displaying the safety (hazard) placards. These appear to be metal plates with several regular holes in each. The limited photographic evidence that I have seen suggests that early 1920s cars from GA had the traditional solid-wood mounting boards, to which paper placards could be tacked or stapled. As for lettering, the pad-printing on this model is very well done. The overall UTLX lettering scheme and the six available car numbers, ranging from 70276 to 70328, are based on the builder’s photo of car 70312 (August, 1920). 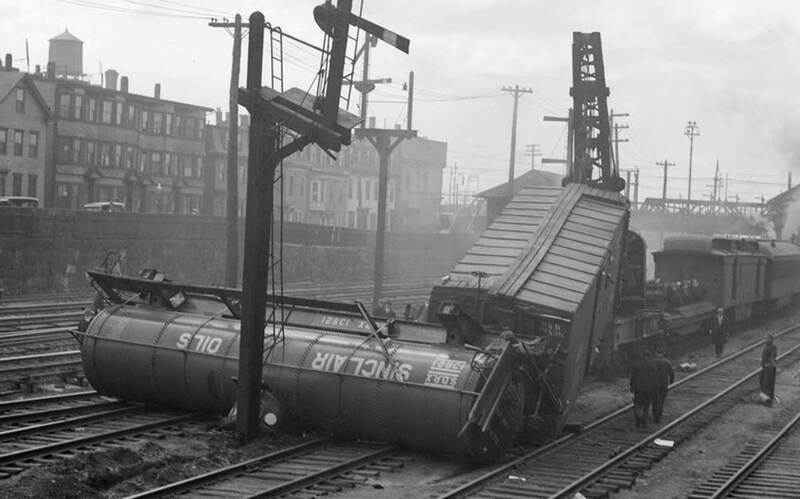 Appropriately, the “UNION TANK CAR CO.” logo is on the right-hand side of the car. Starting in about 1927, UTLX placed this lettering on the left-hand side, above the reporting marks. The absence of the small diamond on the side of the dome is a plus on this version of the model. This marking, which indicated an “approved” manhole closure for the transportation of flammable liquids, was not mandated by the ICC until December of 1935. Image from the Hawkins-Wider-Long collection. Working collaboratively with Steve Hile, we have determined that Union purchased a single lot of 1000 of these cars in 1920, numbered from 70000-70999. But, for reasons not fully known, they were rather quickly renumbered into the 71000-71999 series, probably in 1925-26. In the 1936 tank-car tariff book produced by Ian Cranstone (available from Lulu Press), these cars can be found in 71000-71553, with 449 of those numbers in use. Most of the remaining cars (~540) were renumbered into the 55400-55998 series as they were gradually fitted with steam heaters over time (such renumbering was apparently “SOP” at UTLX). Accordingly, the Tangent road numbers are “good” only for those modeling the first half of the 1920s. In some email correspondence, David Lehlbach at Tangent has indicated that a re-issue using the 71000-series numbering is a distinct possibility. This is more of a comment than a criticism, but I note that the tank and safety valve pressure-test dates on the model are the same as the build date. On all tank-car models that I have seen (such as the Proto2000/Walthers Proto cars), the two pressure-test dates are coincident. But, I just recently learned that, during 1920s, the required testing intervals were actually different: every two years for the valves, and 10 years before the first retesting of the tank. In 1930, these requirements were unified to 10 years for the first retest, and every five years thereafter for both tank and valves. Given the one-inch lettering size of these stencils, this is not a detail that I fret about, especially if the car is well-weathered. I do find the car-end lettering a bit more problematic. The 1920 ARA lettering standards called for seven lines of data: car type (e.g., T-M or X-3), coupler specifications, yoke attachment, brake beam, draft gear, triple valve, and wheel type. Not all tank-cars had all seven lines, but contemporaneously built UTLX X-3 cars consistently had six of the seven (no wheels data). The model has two lines — for the draft gear and wheels — which is consistent with the 1927 ARA standards, but unlikely to have been seen until considerably later unless there was a compelling reason to repaint the car-ends. The photographic evidence that I have seen suggests that UTLX did not include the tank volume (in gallons) until perhaps as late as the 1950s. Last, the brake-service stenciling on the KC reservoir is a nice detail on any tank car, and is in the correct format for 1920, but it looks too big to my eye – probably 1.5 inches. According to Tony Thompson, this became the standard in 1938, but this should be 1-inch lettering for the as-built cars. To date, the Globe Soap cars have been offered in two road numbers: GATX 7137 and 7139. These cars represent a long-term lease arrangement that was not uncommon with GATX, where the lessee’s name and/or logo would be stenciled on the car-sides. How many such cars might have been under lease to Globe Soap is a matter of speculation. Both car numbers appear in the August, 1919, tank-car tariff book (available from Google books) in a much larger group of cars (7100-7382) with 198-gallon domes. Prototype photo from Petroleum Magazine, February, 1921. The model seems to be based largely on a GATC 1921 advertisement in Petroleum Magazine that can be seen on Tangent’s web page. The model is stenciled with a build date of May, 1920, but I am dubious; the 1919 tariff listings alone suggest sometime earlier. I downloaded the magazine in PDF format blew up the image. Although fuzzy, the date on the left end looks like 1918 to my eye (perhaps February), and “M.C.B. CONSTRUCTION” is clearly legible on the right, consistent with a pre-1919 build date. The brake reservoir also seems to have six lines of stenciling, which conforms to the 1917 MCB standard; the simpler, two-line format became the standard in 1920. The car-end lettering is nicely done, and is consistent with the 1920 ARA lettering standards; it seems to follow GATX’s general practices of the period. If the car was indeed built in 1918, however, this lettering would have been slightly different until it was subsequently re-stenciled (e.g., “M.C.B.” notation rather than “A.R.A.”). As with the UTLX car, the brake-service stenciling appear overly large to my eye. And again, the as-built cars had arch-bar trucks that would be much more appropriate for this model. Globe Soap was acquired by Proctor & Gamble in 1928. How much longer the Globe-lettered cars would have run under the GATX lease is unknown, but they strike me as “iffy” for those of us with 1930s layouts. In the 1936 tariff book, 7137 is the same car (albeit with heater pipes added), but 7139 now appears with different tank and dome volumes, representing a mismatch. Moreover, P&G had its own sizeable fleet of cars (PGX): 1223 in 1925, and similar totals through 1935. In the 1936 tariff book, PGX is listed as subsidiary of GATX, suggesting a sale and lease-back arrangement. As per the GATC advertisement, these general-service cars could have been used for a variety of feedstock materials used in soap-making: vegetable oils (cottonseed, linseed), rendered animal fats, caustic solutions (soda, potash), and glycerin. I doubt that they were ever used for finished products. As an aside, I note that the PGX cars were specifically designated for the transportation of cottonseed oil in both tariff books. According to an 1896 U.S. Department of Agriculture report, about 90% of U.S. cottonseed oil was used in the food industry, the remainder being used in soaps and cosmetics. Crisco shortening was made from cottonseed oil, and was introduced by P&G in 1911, with great subsequent success (in part due to the free cookbooks). This may explain the comparatively large tank-car fleet running under PGX during the twenties and thirties. Formed in 1916, Sinclair Refining was one of the fastest-growing petroleum companies of the 1920s. By 1921, the SDRX fleet numbered 4724 cars; by 1930 it had grown to 6289 cars, almost matching Texaco’s fleet-size (which it soon surpassed). With the help of Sinclair enthusiast Mike Schleigh, I have compiled evidence suggesting that Sinclair purchased at least 1100 of the 1917-design cars from GA, and picked up at least another 65 second-hand in the early 1930s. Thus, these 8000-gallon cars comprised the largest single component of the SDRX fleet. Interestingly, the car configurations seem to have varied somewhat (and not systematically): sometimes the safety valves were toward the A end of the car, sometimes the B. Some cars had four handrail stanchions per side, while others had five. In all cases, the photographic evidence indicates that the SDRX cars only had one dome platform, on the brake-cylinder (left) side of the car. I fully expect Tangent to release a RTR version of the SDRX car, but I will also speculate that it will bear the large silver-on-black billboard lettering that probably did not appear until sometime in the 1940s. In the 1920s, SDRX cars all seem to have had a more modest SINCLAIR OILS logo as seen in this 1928 photograph of a similar car built by the Pennsylvania Tank Car Company (PTCCo). Leslie Jones photograph, courtesy Boston Public Library. In order to obtain the most prototypically accurate car possible, I plan to build at least one SDRX car from the kit, including the use of home-made decals. An even more obvious choice might be cars lettered for General American’s own leasing arm. Based on the two tank-car tariff books and my collection of ORERs, there were over 2000 of these cars in the 8000-gallon size running under GATX, most notably in the 13008-14999 series. Based on two photos of car 13908, the handrail stanchions (four) and safety valves (toward the B end) on the Tangent model are correct and, in this case, there are indeed two dome platforms. I would be very surprised if Tangent did not release an RTR corresponding to these GATX cars in the near future; it should be a big seller. Texaco was not a major owner of 8000-gallon cars of the GA 1917 design. I can only find convincing evidence for a very modest number of cars – about 40 (numbered 3825-3888) – that seem to have been purchased second-hand sometime between 1926 and 1930. However, I am considering converting an undecorated RTR to the TCX scheme, in part because the black decals (on a silver body) are easy enough to work up and print at home. The larger TCX fleet – some 7600 cars in 1930 – is very problematic to model as it contained many cars built by PTCCo and by Petroleum Iron Works (PIW) for which there are no quality models presently available. Moreover, the many AC&F Type 21 cars purchased by TCX all seem to have had oversized domes that are not accurately captured by the otherwise excellent P2000/Walthers Proto models. According to the annual tabulations of car orders that can be found in the Railway Age (Gazette), Gulf probably ordered 100 of these cars in 1916 and another 350 in 1919. They seem to have been rather short-lived however. I can some find evidence for them in my 1926 ORER, but they were apparently sold off prior to 1930; I have yet to locate a photo of a prototype in GRCX livery. Gulf did receive some 500 “replacement” cars built by PIW and GA in 1930, just prior to the huge slowdown in car construction in the early part of the Depression. There are probably many other applications for these cars, although I am not aware of any purchases by other major petroleum refiners such as Shell. The 1917 tabulation of orders in Railway Age reveals an interesting array of smaller orders from some small to mid-sized companies: California Dispatch Line (10 cars), L.C. Gillespie & Sons (10), International Refining (50), Magnolia Petroleum (10), Pierce Oil (25), and Wilson Car Lines (50). With the consolidation of the petroleum industry (and of tank-car leasing firms) in the 1920s and 1930s, I suspect that many of these small lots found new homes as second-hand purchases. I look forward to seeing additional suggestions for possible uses of these models in the Comments section. Structurally, these are impressive models. The castings are very crisp, and the level of detail is unusually high in an RTR car. For prototypic accuracy, many modelers will want to replace the factory trucks with suitable arch-bars that would have appeared on the as-built cars and into the1930s. Rivet-counters may wish to remove the second dome platform and ladder on the UTLX cars. The pad-printed lettering is crisp and highly legible (much more so than decals would be in the smaller sizes). 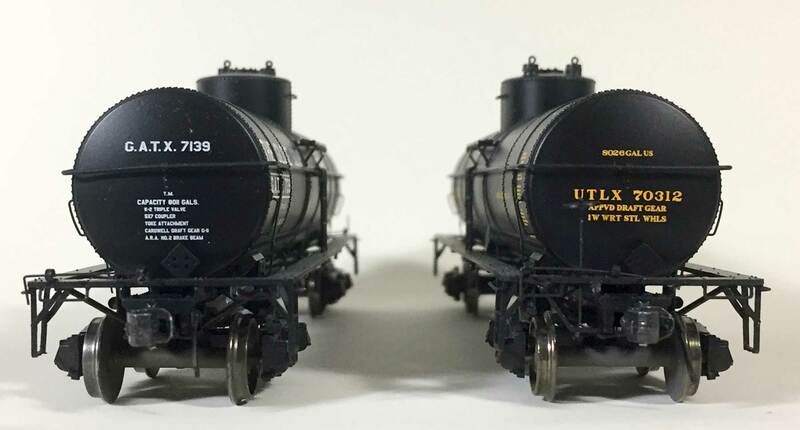 There are some issues with the prototypic accuracy of some of the lettering, most notably the choice of car numbers on the UTLX models, and the build date on the Globe Soap cars. The availability of both undecorated RTRs (in black) and a full-blown kit version of these cars offers additional options for modelers wishing fashion a customized car of the greatest prototypic fealty. I look forward to seeing what Tangent offers in the coming year, both in terms of re-issues and of additional car owners. A big thank you to Dave Parker for sharing his observations and prototype details on these Tangent GATC tank car models. The two models in these photos have been great additions to the 1926 layout fleet. Dave a fine in-depth review of the subject tank cars. Appreciated!